For use with and driven by the Universal Dynamometer (MFP100), the Centrifugal Pump Module is part of TecQuipment’s Modular Fluid Power range. The Centrifugal Pump Module is ideal for student experiments, demonstrations and projects. Centrifugal pumps are common machines used to move water and other fluids in many applications. These can be domestic water systems, agriculture, sanitation and many industrial applications. The module includes a centrifugal pump, a Venturi flowmeter, valves, a reservoir and instrumentation; all mounted on a robust, mobile trolley for ease of use. The separate Universal Dynamometer (MFP100) measures and displays the speed and torque of the pump to calculate and display mechanical (shaft) power. Electronic pressure transducers measure the pump inlet and delivery pressures and the Venturi differential pressure (flow rate). Speed is fully variable up to the maximum allowable for the pump. The centrifugal pump is also the power source for the optional turbines: a Pelton wheel, a Francis turbine and Propeller turbine (all available separately). The turbines fit on the separate Turbine Dynamometer (MFP101a). You can only test one turbine at a time. The Turbine Dynamometer fits onto the Centrifugal Pump Module. The centrifugal pump delivery pipe then connects to the turbine. A pressure transducer on the Centrifugal Pump Module measures the turbine inlet pressure. The turbines and Turbine Dynamometer allow students to test three different turbines to find how they work and perform. When used with an optional stroboscope, students can ‘freeze’ the image of the moving turbines and water flow to improve their understanding of the turbines. For quick and reliable tests, TecQuipment can supply the optional Versatile Data Acquisition System (VDAS®). 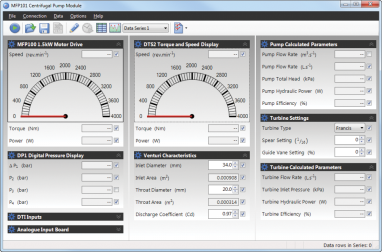 VDAS® gives accurate real-time data capture, monitoring and display, calculation and charting of all the important readings on a computer.